Before Guatemala, Chile, Ghana, Brazil, Vietnam, Dominican Republic, Iraq, Democratic Republic of Congo, Cuba, Indonesia, and Venezuela, they did it in Iran. This website is part of a multi-component project Headquarters: Pathology of an Ouster by Toronto-based artist, Gita Hashemi. In addition to this website, the project consists of an installation and a participatory performance and webcast. The installation, Pathology of an Ouster, and performance, Ouster Remixed, were first exhibited in Toronto as part of Hashemi’s solo show, Time Lapsed , at A Space Gallery in March 2013. They were re-staged at The Idea of Freedom, at MAI (Montréal, arts interculturels), Nov 14 – Dec 14, 2013. The project is about the 1953 US-UK orchestrated coup d’état in Iran that overthrew the popular nationalist government of Dr. Mohammad Mossadeq. The coup is highly significant in shaping Iran’s contemporary political dynamics as well as in the history of Iran-US relations. It aborted Iranians’ movement for oil nationalization and democratic governance, undermined secularism by dividing and subsequently persecuting nationalist and leftist forces, established the Shah’s quarter-of-a-century rule of terror and sowed the seeds of the 1979 Revolution with its widespread popular anti-US sentiments. The present-day tensions between the two states originate in and follow the pattern set by the coup. The significance of this coup goes beyond Iran, however. The operation in Iran was the first of its kind and a model for successive operations elsewhere. The 1954 coup d’état in Guatemala shortly followed. It was modeled on the operation in Iran and involved some of the same agents. Similar interventions were carried out in Indonesia, Cuba, Democratic Republic of Congo, Iraq, Dominican Republic, South Vietnam, Brazil, Ghana, Chile, Argentina, Afghanistan, Turkey, Nicaragua, Cambodia Haiti, and Venezuela. The 1953 operation, named TPAJAX, put to test in non-war conditions what the Western secret service agencies had learned during WWII, including intra- and inter-agency collaboration. It set in place the neo-colonial ideological, structural and organizational mechanisms that justified and operationalized similar interventions in the domestic affairs of other countries. I engage with this history through the now-declassified CIA report written by one of the main designers of the coup, Donald Wilber. Written in 1954, the report chronicles CIA’s alliance with the British SIS in masterminding and staging of the coup. This text is important as it was written shortly after the events to provide the CIA with the outline of the operation and to draw conclusions useful for “future parallel operations.” It is also one of few remaining CIA documents pertaining to the coup. Other documents including original cables between Tehran and Washington were reportedly burned by the CIA as a matter of “routine” in the 1960s. Coming to light in 2000, the Wilber narrative, in spite of its deficiencies, has gained the status of the official US account of the coup. The installation includes the entire report rewritten by hand on paper (75’ x 5’ total dimensions). 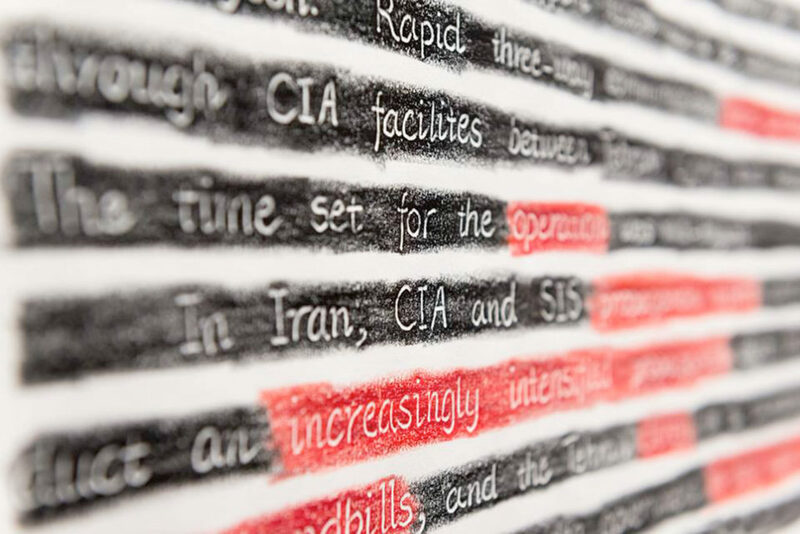 The writing is treated by first debossing and then revealing the text through selective application of dry media in black and red. The debossing process (a form of carving) transforms typewritten text to embodied writing, and the selective application of colours allows for de/recontextualization and re-reading of the narrative. The work’s progress is blogged, marking it as durational and performative. Wilber’s words unmask in new light the devastation caused by their referent events. The very labour of writing by hand makes it possible to attune to the imperial language, to recognize in its “sanitized” and bureaucratic banality its hidden impulses and violent deployment, to embody and reclaim the history it has marked. Inspired by the Iranian tradition of naqali, public reading/recitation of historical accounts and legends, the performance furthers the decolonizing process. Selections from eyewitness accounts and critical authoritative writing of historians (in particular the work of Ervand Abrahamian) are remixed with fragments from Wilber’s text, read by a diverse group of participants whose histories are also marked by colonial interventions. Drawing on their own experiences of imperial intervention, during workshops and rehearsals the performers will take an active role in shaping the piece. The Canadian audience is then presented with the opportunity to witness a collective testimonial and to consider our historical intersections. The performance is recorded on two channels, mixed and streamed live on the internet. The recording subsequently is incorporated into the installation as a single channel video. Headquarters takes its title from the only sentence out of 199 pages of documents that had been made public before a Freedom of Information lawsuit was won in 2000. The sentence read: “Headquarters spent a day featured by depression and despair,” in reference to the first failed attempt three days before the success of the coup. In Wilber’s report “Headquarters” – CIA’s Near East and Africa Division in their central offices in Washington which oversaw the coup from planning to finish – is frequently humanized and assigned not just opinions but feelings. The blog archives ongoing research about the coup as well as the processes and presentations of the project. Headquarters: Pathology of an Ouster was supported by the Canada Council for the Arts through a visual arts grant, and by the Ontario Arts Council through the exhibition assistance program. 1 Pings/Trackbacks for "The Project"